Maurizio Sarri sprung a slight surprise by using Eden Hazard in the false nine position he’s played sporadically this season. Sarri has repeatedly explained that, while Hazard does bring link-up qualities to that central position, this move is primarily designed to get the Belgian away from a position where he has defensive responsibilities. Against a Liverpool side who depend heavily upon their two full-backs for creativity, it made sense not to field the Belgian out wide. A consistent pattern of Liverpool games under Klopp is simple: they start the game with a huge burst of energy, dip slightly before half-time, before emerging refreshed after the interval with another spell of extreme pressure – the same was true of Klopp’s Dortmund sides. That was the case here, as Chelsea took time to settle when attempting to play out from the back: Kepa Arrizabalaga threw the ball straight to Mohamed Salah, and Jorginho’s first pass went to to Keita. After getting through the first 10 minutes, Chelsea were the better side in the first half Perhaps this shouldn’t have been a surprise: Sarri’s style of football is geared around playing through the opposition press. In Chelsea’s 2-0 victory over Manchester City earlier in the season, N’Golo Kante rounded off a fine passing move that was significant because Chelsea had actively baited City into pressing high up the pitch, before transferring the ball quickly through the lines. Against a Liverpool side determined to commit men into the final third to regain possession, that gameplan again worked well. Chelsea boasted a midfield well-suited to playing in this manner, as the three midfielders all offered something different. 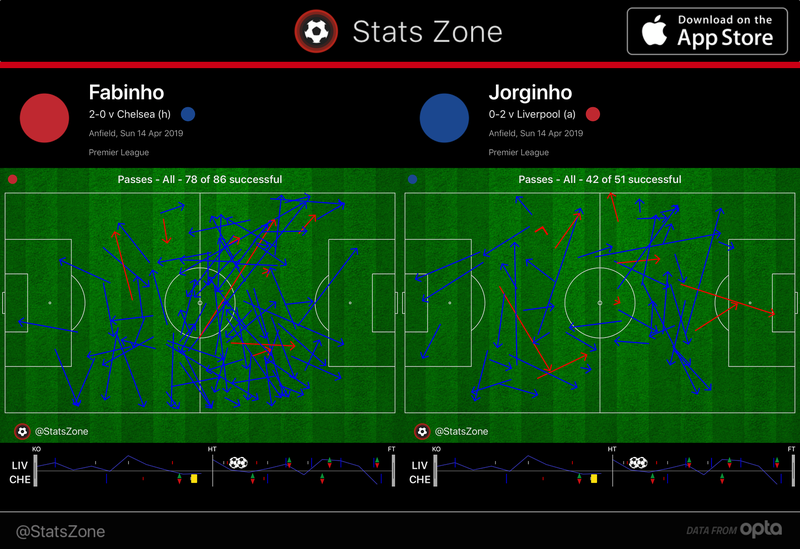 Jorginho had the confidence to receive the ball under pressure and play first-time passes. Kante showed good ball-carrying ability and the guile to play line-breaking passes. Loftus-Cheek offered the physical presence and control to receive those forward passes. A good example came after 11 minutes. This was an interesting situation, because Chelsea had deliberately put the ball out of play so Hazard could receive treatment for an injury. When re-starting play from a throw, Liverpool sportingly returned the ball to Chelsea, by knocking it to Kepa. Of course, it’s slightly poor form in this situation to then immediately press the opposition – but Chelsea actually wanted Liverpool to advance up the pitch, so Kepa and David Luiz waited slightly to wait for Liverpool’s press, and then Chelsea knocked a quick passing combination around Liverpool’s pressure: Kepa, to David Luiz, a square ball to Antonio Rudiger on the edge of the box, a forward pass to Jorginho, a ball out to Cesar Azpilicueta, a return pass into Jorginho, and then a first-time pass to N’Golo Kante, who received the ball on the half-turn and eased past both Keita and Andy Robertson. Chelsea had now bypassed seven Liverpool players who were pressing high, and Kante led a four-versus-three attack that ended, a little tamely, with Alisson pushing away a Callum Hudson-Odoi cross. Liverpool, in fairness, had got numbers back quickly. But it was an example of how Chelsea were capable of breaking directly through the press. There were further examples. After 15 minutes, Chelsea again drew Liverpool’s press: Kepa passed a goal-kick short to Rudiger, got the return pass, and knocked a fine pass downfield to Loftus-Cheek, who chested the ball, turned, and Chelsea briefly were attacking four-on-four. In this sense, as Chelsea’s most physical attacker, Loftus-Cheek was almost acting as the target man when Kepa wanted to kick long. On 23 minutes, Sadio Mane miscued a pass to David Luiz, who passed the ball onto Kante. With Keita, Henderson and Fabinho all converging on him and Liverpool therefore almost over-pressing, Kante slipped the ball between them onto Loftus-Cheek, who carried the ball forward, helping Chelsea to break four-on-four. Once again Liverpool got men back, and once again Hudson-Odoi’s cross wasn’t up to much. On the other hand, Chelsea weren’t pressing well. They made little attempt to block passes into Fabinho (he was far more involved than his opposite number, Jorginho, as the below graphic shows) and with Hazard remaining high up the pitch, Chelsea were slow to close him down when he received the ball. Liverpool’s first major opportunity came when Fabinho had time to play a diagonal ball into Salah, who nodded down for Henderson, whose shot was blocked. Their other good opportunity came after a forward pass to Loftus-Cheek was met with a poor touch, and Liverpool countered through Roberto Firmino’s pass, Salah’s low cross and Mane’s whip narrowly wide of the near post. The game was goalless at half-time, and Liverpool were forced to depend upon their usual wave of pressure at the start of the second half. They were also helped by Rudiger’s departure through injury; Chelsea’s backline looked considerably less secure after Andreas Christensen’s introduction. The start of the second period was about Henderson’s aggressive positioning. In both the 46th and 47th minute he made runs into a centre-forward role, as Liverpool effectively played with a front four. 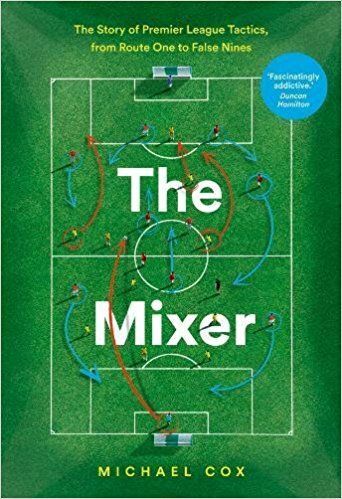 In the 49th minute he, Firmino and Trent Alexander-Arnold congregated on the right flank to box Chelsea towards the touchline, and forced Emerson Palmieri to hopefully hoof the ball down the line. Once Liverpool had regained the ball, Henderson found himself surrounded by Chelsea players, so intelligently recycled possession by knocking the ball back into defence. 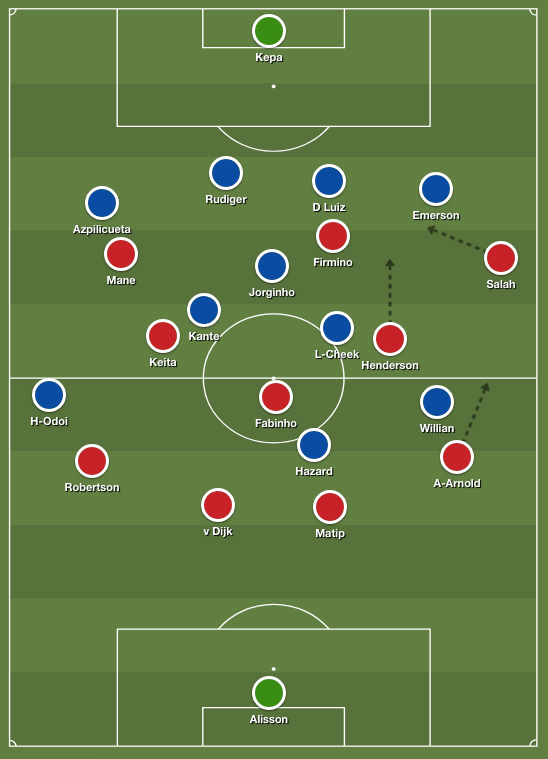 Liverpool then re-attacked down that same flank, and via a slightly fortunate passing combination which saw Firmino’s backheel going through David Luiz’s legs, and both Salah and Henderson being first to loose-ish balls, Henderson dinked the ball to the far post, for Mane to head home. At one stage in the move, Liverpool were basically playing with a front five – Salah, Henderson, Firmino, Keita and Mane. Sarri responded immediately by introducing Gonzalo Higuain for Hudson-Odoi, moving Hazard to the left and Willian to the right, and this prompted a five-minute spell when Chelsea could have scored three times, twice through Hazard – who now popped up in goalscoring positions more frequently from the left than he had when playing upfront. Liverpool, roared on by the home crowd, looked overconfident and lost control of the game. Chelsea’s first chance came after a corner, when Palmieri switched a long diagonal into Hazard, through on goal, and he hit the post. The second came after Higuain held up play and played the ball out to Willian – his cross again found Hazard running inside from the left, but he didn’t connect properly with the shot. Next, Higuain again played the ball out to the right, where Cesar Azpilicueta played a one-two with Willian and then drove the ball across the six-yard box, but both Higuain and Hazard were waiting in a deeper position for a pull-back. Perhaps, with a better understanding and more permanent positioning, one of them would have made the run into the six-yard box. Klopp, in fairness, then calmed down the game with the introductions of both Georginio Wijnaldum and James Milner for Keita and Henderson. Between them, Wijnaldum and Milner completed 26 of the 27 passes they attempted, and having played somewhat recklessly after going 2-0 up, now Liverpool played out time and passed their way to victory. 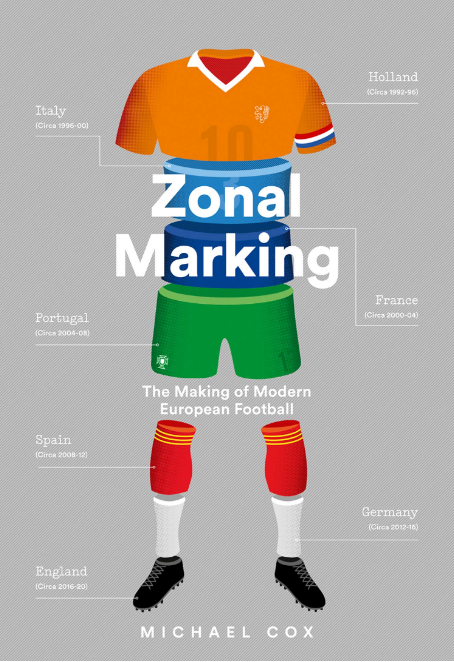 I’ve written a book – imaginatively titled Zonal Marking – about the development of modern European football. It’s out May 30th! While i agree Sarri makes his team player around the oppositions press I don’t agree that Chelsea were better than Liverpool in the first half. They both had the same quality chances. The occasions where Chelsea played brilliantly around Liverpools press in the first half were less compared to the number of times they lost possession to Liverpool’s press or gave away the ball poorly. This is a great shout, thank you! You make it sound like the game was won mostly by luck and Chelsea were at the same level as Liverpool, if not slightly better. Liverpool clearly outclassed their opponents throughout the game (maybe excluding those 3-4 minutes after the 2-0 goal, when they lost their heads a little). The game was relatively even. The sides created chances of roughly equal quality.